We are Kevin and Linda Trott from Somerset, and yes, you've guessed already, we're wurzels, swede bashers, turnip cutters etc., and we even have the proper accent. I work shifts in a local factory doing maintenance and breakdowns, and occasionally some design and development work which is far more interesting. I have a machine shop at home where I can pursue a facet to my other interest, radio controlled model aircraft, where I make my own engines. Linda is retired and she makes sample greetings cards for a TV channel and cards for sale in a local market and at car boot sales. Those that don't sell go to charity. She also looks after me, feeds me, washes my clothes, cleans our house, tends the garden etc., she tells me the list is endless. We became involved in narrowboats way back in 1979 when we hired a six berth boat on the River Wey for our Honeymoon. It was brilliant, and we've been narrowboating most years since. Tranquility is a 58' semi-trad steel hull narrowboat built by Colecraft, fitted out by Elton Moss Boatbuilders. She is powered by a Beta Marine Greenline 43 four cylinder diesel engine, and has a contemporary style interior. Starting at the bow we have the Tipcat followed by the gas locker with enough room for two 13Kg bottles. Under the front well floor is the bow thruster and the stainless steel fresh water tank. Two locker/seats are on both port and starboard sides of the front well. Through the steel glazed front doors, we enter the Saloon. On the portside is the Bubble multi fuel stove, with the TV/DVD/Radio on the starboard. Moving further aft there is a built in settee/double bed and then an 'L' shaped dinette/double bed. Next is the Galley consisting of a Spinflo four burner gas hob and fridge/(small)freezer under. Moving round there is worktop space and stainless sink and separate drainer with cutlery drawer and loads of cupboard space under. Further around is a microwave oven, eye level gas grill and oven with washing machine/tumble dryer under. On the starboard side there is a drop-down table under the trading hatch. Bathroom has a full size shower with mixer tap, a good sized wash basin and a macerator loo with a large storage tank. Next a full width double bed over the storage tank. On to the aft end where steps lead to the control panel, isolators and switchgear, then the rear steel doors and roof hatch. Outside the area is flanked by lockers both sides with engine and controls on the port side. Two steel doors close off the area at night. The counter has the fuel filler, fuel tank vent, two bollards, rudder bearing and tiller arm and finally, the button. We've been hooked on narrowboats since 1979 taking out hire boats once or twice a year as our pocket allows. Then we thought as we do this so often, we should find a cheaper way of doing it. Then we discovered the share boat schemes. After trawling through dozens of brochures from different suppliers we settled on Carefree Cruising for our boat. 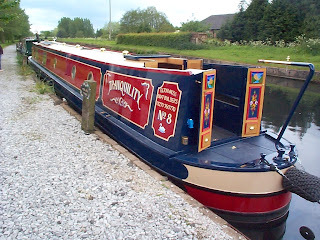 Launched in June 2005, Narrowboat Tranquility has seen many miles up and down the Trent and Mersey, the Shroppie and the Llangollen to name just a few. In May of this year (2008) TQ moved moorings from Sandbach to Alvechurch, so we now have the opportunity to explore areas new to us. In the offing are the BCN, Worcester and Birmingham, the Stratford, the Grand Union and more. These are tales of our exploits along the way and we hope you'll find them interesting.